"It will be the same when the Son of Man comes again as it was when Noah lived. In the time of Noah, people were eating, drinking, and getting married even on the day when Noah entered the boat. Then the flood came and killed all the people." Noah's character went totally unappreciated by his contemporaries. They ignored Noah's warnings about God's impending judgment and their need to repent. They went on doing what they had always done, even as the rain started to fall. When Jesus returns in his glory, those who have lived for him will be waiting in expectation for his return and be overjoyed. 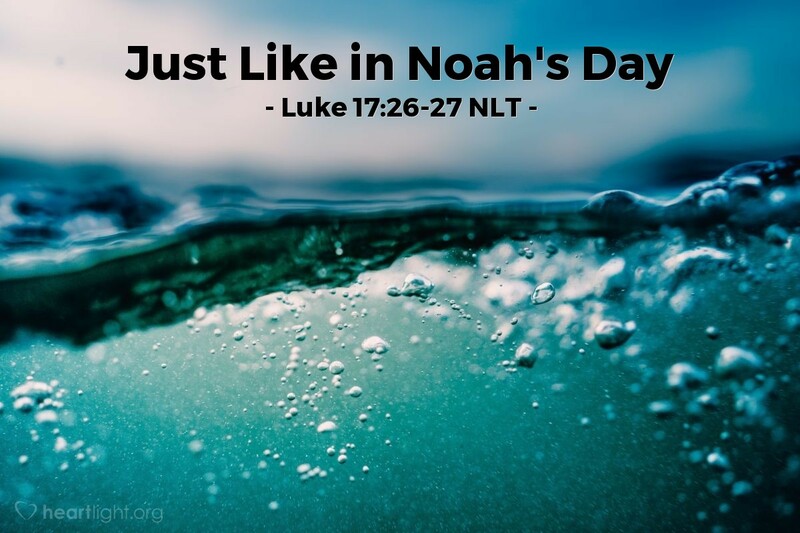 However, those who have ignored his call to follow him and who have spurned his grace will be caught off guard just as much as those in Noah's day. It's sad. It's tragic. Let's try to make a difference in as many of those lives as we can! Father, I know Jesus will come with glory. I know that his return will catch many off guard. Please use me to help those around me to be prepared and full of joy at the return of Jesus, in whose name I pray. Amen.